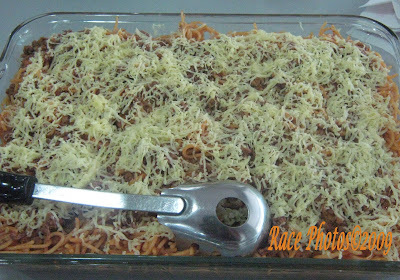 My entry for today is one of my favorite snack - spaghetti, well I love all forms and kinds of pasta and because I love it it's also one of my specialtes. My kids would always tell me whenever I cooked spaghetti that it tastes better than Jollibee lol! Kids always compare anything that they eat with Jollibee, McDo and KFC, funny! Well this is not my cooking it's one of the foods that we ate this lunchtime. It's Berry's birthday (my senior boss’ daughter) on Sunday and she ordered KFC chicken and brought this spaghetti which is actually different from my saucy pasta but tastes yummy too with lots of cheese and ground meat! Sorry guys for the not-so clear shot as my battery run out of life and I'm too hungry to switch battery and repeat the shot! This will do for now! Happy Food Friday to all, enjoy your weekend! I love spaghetti too. I prepare it with liver spread. Sarap! I miss the pinoy style spaghetti, even our cheddar cheese, cheddar cheese here tastes bland, when I buy naman from the asia shop ng cheese natin mahal lol, dami reklamo...ur presentation also looks so good! That looks good. I'm fond of different kinds of pasta for snack too.